On the subject on making "Baby Driver" his next film Edgar said, "I’d like to make Baby Driver next if possible." He continued to say, "On this film and other things I’ve been blogging furiously and putting up a photo every day, but I think when I do that one I’d like to go completely silent for once." That's all well and good Mr. Wright, but what about the status of "Ant-Man" or "The World's End". Wright explained, "I’m not one of those people who can do three things at the same time, even though I try to be. So once I’m doing one thing, like this, I’m only doing this. Other things – like Ant-Man and me and Simon’s next film – have all gone away until I’m done with this." Damn it! I have been really excited to see what Edgar Wright could do with the Ant-Man character, but now instead he wants to make a movie called "Baby Driver", a film title alone that instantly makes me throw-up in my mouth. This news also questions whether Ant-Man will be apart of the upcoming "The Avengers" film currently slated for a 2012 release. Hank Pym was one of the original Avengers and his character creates some very intriguing plot developments throughout the comic's various runs. Hank has also been a few various heroes including Giant-Man and Yellowjacket. I can't imagine an Avengers movie without Pym involved. 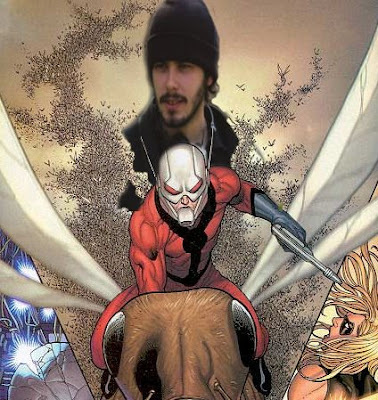 Edgar Wright would be very hard-pressed to get "Ant-Man" filmed prior to "The Avengers" release date if he indeed does follow through with "Baby Driver", leaving a huge question mark surrounding what Marvel will do with Ant-Man.